We drove by and had been meaning to try (after they opened May 2018). Looks like a Candy shop with Ice Cream but. Ice cream made by other companies. Not badly priced, but flavours just seem average. Ice Cream Sandwich made with good cookies. but at 8$ a little pricey. Staff friendly and helpful. Got to try at least once. Location at Main and East King Edward. Good luck and enjoy! We (family of three including a 7 year old ice cream enthusiast) were so excited to have a new ice cream place in the neighbourhood. With Ernest Ice Cream on Fraser and Buckets down the street on Main - I expected this ice creamery to have better ice cream. During the opening week, there were plenty of staff behind the counter but they weren't super customer service oriented - it took quite awhile to get 2 scoops of ice cream and there was only one person in front of us (who ordered one double scooped ice cream). Their ice cream is at best mediocre. We did return 2 more times to give them a chance to iron out opening hiccups but the ice cream isn't any better, and the customer service is nothing to return for. There are some neat candy options if you are looking for something for your sweet tooth. Really like this addition to Main Street. Wonderful retro vibe with sweets and ice creams plus coffees and so on. The ice creams were great with some fun additions. Definitely worth popping in to. I love Yum! All the staff are friendly, approachable, and helpful. Their ice cream sandwiches are AMAZING and always a hit! I would love to try everything there. They have a great selection of candy and sweets. All I can say is, Yum! The atmosphere is reminiscent of Sugarfina and they offer samples of their ice cream. Make sure to stop by if you're in the area! Ice cream has become very trendy in Metro Vancouver, and as a result yet another cute shop offering it has popped up. The decor is bright and fresh. They sell LOTS of candies in bulk as well as boxed/wrapped ones. As to the ice cream, they don’t make their own, but rather offer those from other well known local quality ice cream makers such as Rocky Point. Apparently they offer 16 different flavours that will change periodically. This place is just getting off the ground, and will need some tweaking. As an example, I am gluten free, and the candies/ice creams are not clearly marked as to which are and which are not. Yes, they have it noted on a sheet of paper that the server can refer to but that is not time efficient. Having a list on the counter of what flavours are available isn’t good enough...they need get a way to mark each tub, as we could not tell which flavours were which, other than perhaps vanilla and chocolate. This place will become very popular for sure, and if you are an ice cream lover, you will head right for it!! 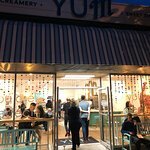 Been to Yum Ice Creamery and Sweet Shop? Share your experiences!